Just before the start of reading week, Yuen Yuen Ang from the University of Michigan gave a talk about “How China Escaped the Poverty Trap” as part of the ID Department’s Cutting Edge Issues in Development lecture series. Here’s what two students thought about her lecture. As a dark, depressing and cold November began to descend on London, the International Development Department was briefly, for a few hours, lit up by the wonderful presence of the University of Michigan academic, Yuen Yuen Ang, trailing her seminal new work How China Escaped the Poverty Trap. Attendees, myself included, who had not yet had the chance to peruse her work, entered expecting a talk dominated by the merits of Chinese autocratic government over democratic political institutions to produce a poverty-reducing growth strategy. 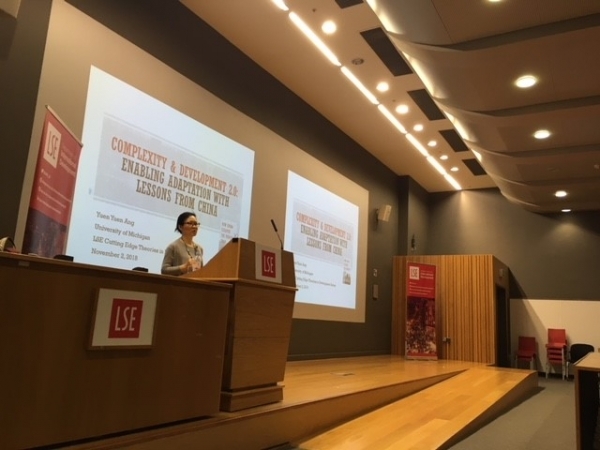 But I was pleased that I couldn’t have been more wrong: Yuen Yuen Ang shared with us an exciting theoretical perspective on complexity theory, adaptive systems and even Nigeria’s nascent ‘Nollywood’ industry that left me rushing to the LSE Waterstones to see if I could bag myself a copy. The lecture started with a look at Ang’s new theoretical paradigm, which she had named as Complexity 2.0, a step from saying that adaptivity and experimentalism was the key to development, to placing the emphasis on enabling that creativity – this was the unnoticed challenge of development. This was the key to escaping a cycle of poverty leading to poor, weak institutions, which in turn lead to further entrenched poverty, and so on. This also moved past previous simplistic attempts of either throwing aid at problems or a lacklustre ‘good governance’ programme. Post-reform China was the model for this new paradigm and Ang insisted its lessons could be extended from developing countries to the private sector. “摸石头过河” or “Crossing the river by feeling for stones”, was Deng’s pithy summary of his strategy, and Ang demonstrated how the Chinese state gave key areas the right amount of legal and political ambiguity (through what she called ‘grey’ policies) to experiment. This was not across the board: finance was controlled, but e-commerce was “the wild west” (leading to quite a large expansion!). This solved the key challenge of autonomy – how to keep in control, but allow experimentation. The elephant in the room was that authoritarianism, through which a ‘director’ (e.g. Deng) could facilitate this, was inherently suited to this model. Could this really be transferred to democracies? Ang argued yes, but with modifications necessary and Nollywood showed us how to experiment with the institutions you have– the film producing phenomenon started by working with the region’s large pirating industry as distributers. I walked away with my paradigm permanently shifted. James White is an MSc Development Studies student at the LSE and a graduate of Cambridge University. His research interests include Chinese corruption and governance, as well as the dynamics of social change and discourse. As the fourth speaker of the Cutting Edge Issues in Development lecture series, Yuen Yuen Ang gave a succinct summary of her book ‘How China Escaped the Poverty Trap’. Recommended by both scholars working inside and outside China, the book takes a different approach to the economic rise of the world’s most populous country. As someone who studied China’s reforms, I found Yuen Yuen Ang’s answer to the degree of autonomy allocation fascinating. A degree of autonomy is beneficial to the policy making process when there is a need of adaptation. That is to say, policymakers in a local township or a province would be more successful if they adapt the policy to the local context. The question is on how to allocate this autonomy with the respective policies in question. Ang’s answer to this runs through the speeches given and directives sent by Deng Xiaoping, Chairman of the CCP, who started the opening up reforms. She claims that the level of ambiguity in Deng’s words were the main determinant on how much autonomy the local policymakers would end up having. Ang suggests that the central leadership in Beijing gave more ambiguous statements when they wanted local experimentation. This gave enough space for local bureaucrats to change the specifics of the policy to reach desired outcomes, and made sure the policies were reaping the benefits that were present on a local level. In countries that have the magnitude of China, adaptation to the local conditions is necessary, so Ang’s model is a valuable one that outlines how we can do it. As policy experimentation has become a silver bullet in development, it is important to know how we can make bureaucrats experiment with the policies, and see what sort of incentives makes them do so. With Ang’s model, we can see a way to explain the methods of autonomy allocation from the central authority. In the case of China, directed improvisation by Beijing allowed the state to retain power while allowing local policymakers to take initiatives. Would Deng’s system work elsewhere? The model employed by China may not be useful in other parts of the world where we don’t have such high attention to detail when it comes to the wording of the directives for example; but this difference would precisely underline the logic of the strategy, and force others who took their lessons from the Chinese experience to adapt to their own conditions. Erkin Erguney is an MSc Development Studies student. He has a master’s degree from Shanghai Jiao Tong University on China’s Politics and Economy, and can use chopsticks with both hands. Next up in the series: Stefan Dercon from Oxford University will speak on “Don’t Panic Prepare: Pathways for Inclusive Growth in the Digital Age”. The lecture will be held on Friday, 16 November, from 4 to 6pm in the Sheikh Zayed Theatre in the New Academic Building at the LSE. External guests should contact S.M.Neuenschwander@lse.ac.uk to reserve a seat.